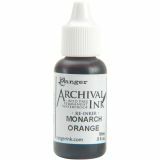 Archival Re-Inker .5oz - RANGER-Archival Reinker. Perfect for Archival Dye Ink pads. This package contains one 0.5 fluid ounce bottle of dye ink. Available in a variety of colors: each sold separately. The ink is acid free, permanent, waterproof and conforms to ASTM D4236. Made in USA.